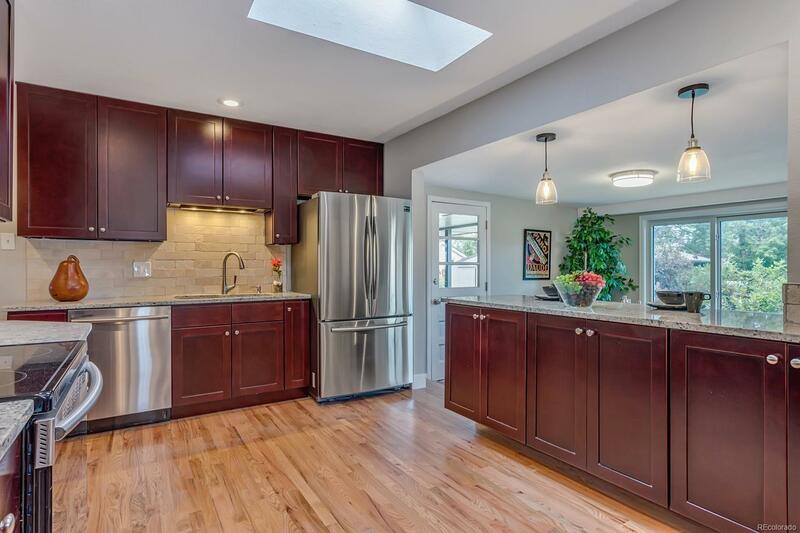 Exceptional ranch-style home that's been professionally remodeled from top to bottom! You won't be disappointed with beautiful hardwood floors & natural light that beckon you inside to the well-designed open flow of the living, dining, large kitchen & spacious family room. Large gatherings are no problem here! The hardwood floors continue down hall and into the 3 main floor bedrooms including master bdrm. All 3 baths have designer tile including built-in niches. You'll love the stylish and tasteful finishes! Basement offers huge rec/media room, large laundry/craft room & 2 additional bedrooms. Wait until you see the incredible backyard with amazing patio space, water feature, garden area & soft grass! Don't miss this spectacular home in desirable, established Green Mtn Village! Devinney Elementary was awarded National Blue Ribbon School 2016! You'll be close to Green Mtn, Red Rocks, 6th Ave, C470/I-70, Belmar, Fed Center this is a phenomenal location. Light rail station at 2nd & Union.